I went shopping for eyeglasses last weekend with my friend Lisa Ferber, as I'm following my readers’ advice about taking along a trusted friend in order to find a pair that suits me. She patiently watched and advised as I tried on dozens of pairs of glasses throughout the afternoon. The routine was: I'd try on a pair, look at her, look at the glasses clerk, and then look in the mirror. And every time I’d look in the mirror, Lisa would say, “No pouting.” This went on for about an hour, until finally she forbade me to stop making my “mirror face” for the rest of the day—not that her directive helped, because it’s utterly beyond my control. I’ve written about my mirror face before (unsurprisingly, when I was doing my mirror fast). But this was different, and it took me a while to realize why. When I looked in the mirror at my bespectacled self, I thought I was giving myself the same look that I’d just given my friend. I was able to believe that because the face I saw reflected back at me wasn’t my usual, and private, mirror face—another expression I can’t control, but that I can easily spot as ridiculous. This was less pouty (Lisa’s protest notwithstanding), a little more grim, a little harder, the jaw a little more set. Unlike my mirror face, which is a subconscious attempt to control how I see myself, this face was an attempt to not look as though I knew I was being observed. This face was supposed to be natural. It wasn’t natural, of course—far from it. But it might be innate. 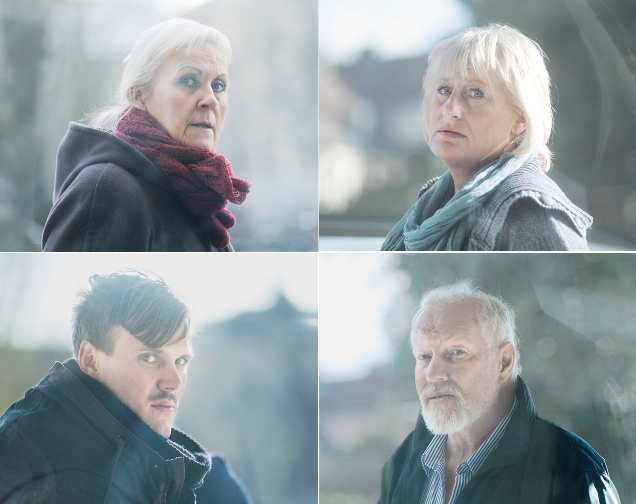 I saw my public mirror face crop on on the faces of total strangers in this project by Swedish photojournalist Moa Karlberg, who set up a camera behind a one-way mirror and photographed subjects looking at themselves, unaware they were being photographed. (Thanks to Caperton at Feministe for the link.) Karlberg’s written intention for the series indicated that she wanted it to be a comment on privacy rights in public spaces. But the takeaway is something quite different. What’s striking about the photographs is how most of the people in them are wearing a nearly identical expression—across ages, across genders, across cultural types. Examining that expression, I’m drawn to the pensive defiance on the subjects’ faces. The mouth is slightly open, a steely expression in the eyes. To me, what this says is: I am not actually looking at myself; I merely happened to catch a glimpse of myself while walking by. (And, after a month of avoiding mirrors, I can tell you that the unaware glimpse does occasionally happen—and that most of the time there’s a reflective surface around, you damn well know it.) The feigned nonchalance is a part of how we make our way through the world; it’s how we avoid seeming to think that we’re overimportant, or self-absorbed. It’s the equivalent of a big, surprised “Oh, hi!” we give an acquaintance we’d spotted earlier in a crowd but delayed saying hello to for whatever reason. It’s the face we wear when we’re walking down an long hallway toward a coworker but aren’t yet close enough to acknowledge their presence without creating awkwardness. It’s neither private nor public; it’s a performance that you hope nobody sees but are certain to perfect in the event that they do. Great post, as always, m'lady. So, where are the new frames? Pouty pic please! Even more interesting would be to take on the "Camera Face." I just saw a blog where the girl was getting married and had her Camera Face in every photo. It got to the point where I felt kind of pained for the girl. Just smile! THe world will not end if you cheek bones do not look sculpted. I try to remind myself not to look at my reflection in windows. Why? Well, because if you're looking at yourself, you're not seeing what's actually inside, which is probably more interesting that you. Heeheehee I totally dawdle in public bathrooms until everyone has left or is in a stall to do a mirror check! Fascinating...I've never thought about the dynamics of self-observation in such a nuanced way before. Certainly I can't be the only person who has ever dawdled in a work bathroom in hopes that the other people present will leave so I can observe myself in peace. I definitely do this -- especially if it's right after lunch, and I want to see if I have food stuck between my teeth. Courtney, I love your point about the windows! And YES on the camera face. I've gotten a little better with that by just smiling as big as I possibly can. Steph, WHEW! Glad I'm not alone. Anonymous, I'm sorry you were triggered. To be honest, though, I genuinely don't understand what was triggering. I'm guessing something about privacy violations in public space, but I really don't know. In any case if you're "anonymous for this" I'm guessing you're a regular reader; please feel free to e-mail me at the.beheld.blog at gmail dotcom if you want to let me know privately what it was that was triggering to you, or of course comment here anonymously if you wish. When I write something that I sense may be upsetting to some readers, I try to make it clear in the headline with the topic is so that readers can avoid it if they'd prefer to--but I can't phrase things so as to avoid triggers if I'm unclear as to what the concern is. Terri, I might not have had I not been called out on my public mirror face so many damn times! Tori, funnily enough I hardly ever worried about this until the mirror fast. People kept asking me "but what about checking to see if you have food in your teeth?" which then made me totally paranoid about it!